Actor Lee Byung-hun has been named California's tourism promotion ambassador to Korea. He received a letter of appointment on Wednesday from visiting California Governor Arnold Schwarzenegger. 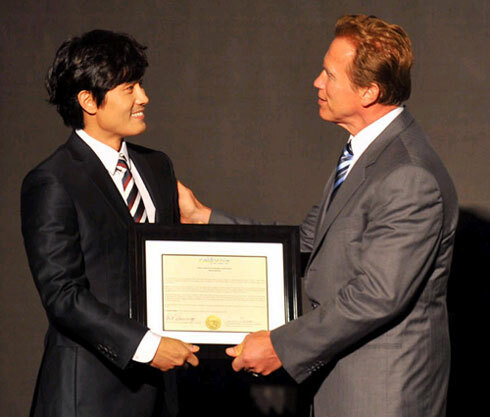 Lee Byung-hun receives a letter of appointment as California's tourism ambassador from the U.S. state's Governor Arnold Schwarzenegger in Seoul on Wednesday. Lee has also been selected as the winner of this year's Seoul International Tourism Award, which is given by the Seoul Metropolitan Government to individuals or groups who contribute to the growth of the tourism industry. The actor was picked for the award in recognition of his hand in bringing Seoul into the spotlight in many countries through the TV show "Iris" among his other hits.